You may find that some of your students have not properly registered their clicker licenses (AKA Subscriptions) and others may not have successfully made an account at all with Turning. 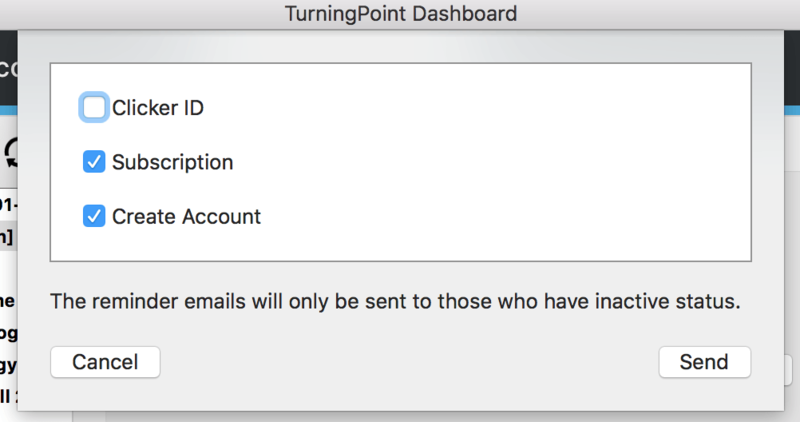 An easy way for you to reach out to these students is to use the new email feature in TurningPoint. To do this, launch the software, and go to the Manage tab. Then, select your course on the left panel so it is highlighted. in the upper right corner is the envelope icon. On the top right, there will be a little envelope icon. Click that, and it will give you options to reach out to your students. Do not check the Clicker ID box as students using mobile devices will get a message telling them they need to add a clicker ID. But, do check the Subscription and Create Account boxes and then click Send. Students who need to just add a subscription will get instructions to do so, and students who need to create an account will get the appropriate instructions as well.